Latin name: Lycopersicum esculentum Mill. Family: Solanaceae - họ Cà. 100g tomato have 90g of water; glucide: 4g; protit: 0,9g; lipid: 0,3g; organic acids (malic, acetic, citric ...), minerals (Ca, P, Mg, K, S); the trace elements (Zn, Cu, Fe, B, I, ...) and vitamins (A, B1, B2, B6, C, PP, E, K). 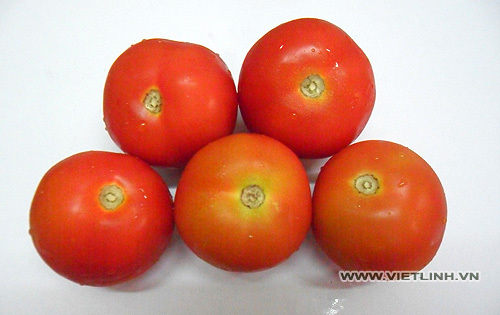 Daily fresh tomato 100gam can offer: 13% vitamin A, 5% bolic acid, vitamin B 8%, 33% vitamin C, 22 calories of energy. Today in the world of work in many countries there have been many experiments demonstrate tomatoes work well in the treatment of some cancers. A study by Israeli scientists said in tomato lycopene helps cells to avoid the attack of free radicals, which acts to prevent the development of cancer cells. Japanese scientists said if every day to eat a tomato, it will reduce by 50% the risk of lung cancer. At Scientific Conference "Benefits of EGCG from green tea and tomato pigment lycopene for human health" in 2003 in Hanoi, director of nutrition Asia Group Roche Vitamins, Mr. Tom Bruynel, that lycopene can reduce the risk of prostate cancer, gastric cancer and lung as well as reduce the risk of cardiovascular disease. Tomatoes contain a lot of vitamins and micronutrients such as iron, calcium, magnesium, nickel ... pigmented lycopene and beta-coraten are powerful antioxidants that prevent cancer cells and prevent blood clots in blood vessels. Tomatoes can be extremely good for weight loss because it contains a lot of water and fiber, which helps users quickly and limited no appetite.